On 7 December, political economist Ann Pettifor, Honorary Research Fellow at CITYPERC London (City University), Director of the Policy Research in Macroeconomics (PRIME), and Executive Director of Advocacy International, will receive this year´s Hannah Arendt Prize for political thinking in Bremen. The prize is awarded by the Heinrich Böll Foundation Bremen. On this occasion, Ann Pettifor will participate in a colloquium on the power of finance with Rudolf Hickel and Dieter Rucht on 8 December (11am) at the Institut francais Bremen. For more information can be found here (in German language). Sebastian Bo tzem and Judith Hesselmann have published a new article in “Leviathan – Berliner Zeitschrift für Sozialwissenschaft”. The German text “Gralshüter des Ordoliberalismus?” analyzes the compositon and theoretical orientation of the German Council of Economic Experts, an official advisory board to the federal government. Sebastian and Judith find that the council follows the ideological narrowing that prevails with the economics disciplin. Moreover, recently, the council members have increased their networking activities towards ordoliberal think tanks. The article can be found here. Sebastian Botzem and Natalia Besedovsky have published a chapter on finance as an emerging transnational field in the edited volume “Netzwerke in gesellschaftlichen Feldern” (networks in societal fields). The volume is edited by Jan Fuhse and Karoline Krenn and was published by Springer VS. In their contribution, Natalia and Sebastian analyze the network configuration and the institutionalization of organizational relations within finance between 2003 and 2013 with the help of our GloFIELD database. They find that financial organizations are increasing their interrelations in order to allow for exchange of information and coordination. Moreover professional associations, knowledge providing organizations and bodies of private self-regulation are increasingly forming the core of the transnational financial field. The publication summarizes some of the core findings of the research project on the global financial elite and can be purchased online. In September, Sebastian Botzem, Marcus Wolf and Sebastian Möller will present a paper on “Financializing through ideas” at the 2018 annual conference of IIPPE – the International Initiative for Promoting Political Economy – at the University of Pula, Croatia. The theme of the conference will be “The State of Capitalism and the State of Political Economy”. In our paper we are aiming at analyzing the pervasiveness of financial ideas and narratives – a theme that cuts across the different projects pursues by the research group. It brings together accounts from constructivist IPE and empirical findings from our ongoing research. The presentation will be part of the conference´s stream on financialization and is (preliminarily) scheduled for session 5 on 13 September (11:30- 1:30, Room 2). On 25 July, Sebastian Möller presented his research on municipal derivatives at the 5th Global Conference on Economic Geography in Cologne. In his talk “The financialization of municipal debt: Local governments and the brave new world of derivative capitalism”, Sebastian summarized his empirical findings on debt management practices of Manchester (UK), Essen (DE) and Linz (AT) and discussed his analytical approach of tracing the micropolitics of local state financialization. The talk was part of a series of panels on the financialization of the state that Sebastian co-chaired with Laura Deruytter and Reijer Hendrikse from the Cosmopolis Centre for Urban Research of the Vrije Universiteit Brussels. Marcus Wolf has published an article on “Behavioral economics and the making of financial literacy” in the latest issue of Economic Sociology – The European Electronic Newsletter. This issue is dedicated to “The Laws of Economics” and is the second issue edited by Olivier Godechot (Science Po). In his contribution, Marcus links the ascent of financial lietarcy as political project to the rise of behavioral accounts within the field of economics. By doing so, he connects the sociology of professions and the histroy of economic ideas in order to shed light on the impressive academic and political career of financial literacy as alleged solution to financial market imbalances. Particulary, Marcus argues that the idea of financial literacy has served as a coalition magnet and aims at further deepening the financialization of the everyday life through discoursively disapproving “out-of-date” financial behavior. In February, Sebastian Botzem will present recent findings of his ongoing research on global financial elites at a conference on the repercussions of the financial crisis ten years after its outbreak in Darmstadt (Germany). The conference “Nachbeben. Zehn Jahre Finanzkrise und ihre Auswirkungen in Deutschland und Europa” is co-organized by the Schader Foundation and the Political Economy section of the German Assocaition for Political Science (DVPW). In his talk (23 February, 1pm), Sebastian will analyse the rise of transnational professional and advocacy associations as vastly invisible lobbyists since the crisis. The presentation will be part of a panel on changing actor constellations in global finance. The full program of the conference can be found here. Natalia Besedovsky published an article in Socio-Economic Review (currently as „advance access“ paper). Using the case of Moody’s, a major credit rating agency, her article “Financialization as calculative practice (…)” traces a fundamental paradigm shift in rating practices since the late 1980s. These innovations were driven by new calculative models, new kinds of analysts (so-called ‘quants’), and a profit-oriented organizational culture at Moody’s, all shaped by an increasingly financialized context. By studying credit rating agencies’ historical and current methodological publications and interviewing rating analysts, Natalia shows that the rating innovations of the 1980s and 1990s entail an entirely different set of epistemological assumptions about the calculability and predictability of the future, representing a fundamental paradigm shift in calculating and defining credit risk. In this framework, risk is not a threat that must be minimized, but a neutral variable that can be calculated, managed and used to generate profits. This new culture of credit risk assessment enabled the emergence and exponential growth of structured finance markets, fueling a culture of high-risk investments. The article contributes to the literature on financialization by arguing that financialization occurs both at the level of organizational culture and calculative practices. Sebastian Botzem, together with Sigrid Quack (University Duisburg-Essen) and Solomon Zori (Rotterdam School of Management), published an article on the adoption of international accounting standards in Africa in the journal Global Policy. Their article “International Accounting Standards in Africa: Selective Recursivity for the ‘Happy Few?” is part of the current issue´s special section on “Recursivity in Transnational Governance” edited by Olga Malets and Sigrid Quack. The article discusses the lack of participation of African stakeholders in the standard-setting process as well as the conceptual mismatch between the standard-setter’s objectives on the one hand and the socio-economic, cultural and political conditions in many African countries. In mid-December, Sebastian Botzem and Sebastian Möller will participate in an international workshop on “Social Networks in Financial Production and Regulation” organized by Adam Leaver and Len Seabrooke and hosted by the Copenhagen Business School (CBS). This event will be a follow-up of last year´s “Networks in Finance Workshop” at Manchester Business School. Sebastian Botzem will present latest findes from his research on the reconfiguration of global financial elites. His presentation “Elite Networks in Global Finance – Characteristics of the Financial Elite” is schedulded for Wednesday, 13 December, 2-3.30pm. On Thursday (10.45-12.15), Sebastian Möller will talk about “Debt Management & Creative Finance in City Hall: Modes and Networks of Intermediation Between Global Finance and Local Governments”. Our colleague Marcus Wolf has contributed to the new blog of the German Association of Political Science (DVPW) working group on orders of violence (Gewaltordnungen). His blog post “Die symbolische Gewalt der Schulden” raises the question whether and under which circumstances debt relations can be interpreted as manifestations of symbolic violence. Marcus argues that in a historical perspective, the morality of debt has often led to forms of direct or indirect violence against debtors, for instance in the case of debtor´s prisons. Nowadys, under the regime of debt-driven consumption, the symbolic violence of debt is much more inscribed in a new governmentality of financialization and is expressed in new attributions of responsibilities and in hidden power relations. Together with Laura Deruytter and Reijer Hendrikse from the Vrije Universiteit Brussels, Sebastain Möller is co-organizing a panel on the “Financialization of the State” at next year´s Global Conference on Economic Geography (GCEG 2018) in Cologne. The Call for Paper can be found here. Abstracts can be submitted until 15 March 2018. This week, the International Relations section of the German Association for Political Science (DVPW) will gather for its open conference at the University of Bremen. From Wednesday to Friday, there will be lots of panels covering a broad variety of IR issues including International Political Economy and global finance. Members of our research group are participating in the conference. On Wednesday afternoon, Sebastian Botzem will present a paper on elite organization in global finance (3.15-4.45pm, Room SFG1040). On Friday morning, he will chair a panel on global finance in which Marcus Wolf and Sebastian Möller will jointly dicsuss four papers on financial governance (11.15-12.45, Room, SFG1030). More information on the confernce can be found here. This week, Sebastian Botzem will present his ongoing research on the reconfiguration of the global financial elite at the 11th Pan-European Conference on International Relations in Barcelona, organized by the European International Studies Association (EISA). His presentation is titled “New kids on the block: The rise of private non-profit organizations in cross-border financial governance”. It is schedulded for Friday, 15 September, 4:45pm (room 40,008) and will be part of a panel on continuity and change in financial regulation chaired by Malcolm Campbell-Verduyn. On September 7th, Sebastian Möller will be guest speaker at an EUFINGEO seminar on “The Financialization of the Local State” at COSMOPOLIS, the Centre for Urban Research at Vrije Universiteit Brussels. He will be presenting conceptual insights from his doctoral research on the transformation of local authority debt management and the use of interest rate derivatives. Moreover, Laura Deruytter and Reijer Hendrikse from COSMOPOLIS will contribute to the discussion on the financialization of state policies and institutions. Marcus Wolf will present his findings on the ascent of financial literacy education as a political project at two conferences. At the European Sociological Association (ESA) conference in Athens “(Un)Making Europe: Capitalism, Solidarities, Subjectivities” he will present a view on the changin narratives around financial education before and after the financial crisis. At the Berlin conference of the International Initiative for Promoting Political Economy (IIPPE) he will present on the role of (behavioural) economists in the making of financial education. The University of Innsbruck interviewed Leonhard Dobusch who has co-authored an article on the financialization of the European real estate sector with Sebastian Botzem. The article “Financialization as strategy: Accounting for inter-organizational value creation in the European real estate industry” will be published soon in “Accounting, Organizations and Society” and is already available online. In the brief interview (in German language), Leonhard presents core findings of the study that traces the stream of fees and the role of intermediaries in financialized real estate. The authors argue for a re-regulation of financial markets based on the issue of fees. The interview can be found here. This Friday (30 June), Sebastian Botzem and Natialia Besedovsky will present a paper on “The Rise of Knowledge Intermediating Organizations in Global Financial Regulation” at the SASE conference in Lyon. In this paper, the authors apply a social network analysis approah to the study of changes within the global financial elite within and after the latest financial crisis. It summarizes some of the empirical findings and conceptional debates surround their common research project on the global financial elite. Moreover, Sebastian will be the discussant at Thursday´s panel on “Regulation and Governance in Emerging Economies”. This year´s conference theme is “What´s Next? Disruptive/Collaborative Economy or Business as Usual?”. The Society for the Advamcement of Socio-Economics (SASE) brings together scholars from sociology, political economy, management, political science and other fields interested in socio-economic dynamics. Sebastian Möller has written a short report on the spread of so-called LOBO (ledender option – borrower option) loans among British local authorities for SPERI comment, the blog of the Sheffield Political Economy Research Institute (SPERI). In his contribution, “Financializing town halls: Local councils, LOBO loans and the derivatives markets”, Sebastian briefly introduces this new type of market debt that became quite popular among UK city treasurers prior to the crisis. He describes how a complex network of different public and private actors including new intermediaries, such as treasury management advisors and brokers, facilitated the spread of LOBO loans. Contrary to experiences made by many continental local governements, in the British case the derivative character of this new financial instrumentwas much more hidden, since LOBOs constitute a form of embedded derivatives. In his PhD research project, Sebastian explores the financialization of municipal debt management across Europe. Sebastian Botzem and Leonhard Dobusch have published a new article on the financialization of the European real estate sector in Accounting, Organizations and Society (AOS). The article “Financialization as strategy: Accounting for inter-organizational value creation in the European real estate industry” is now online available. Abstract: Financialization – the increasing relevance of financial markets, financial actors and financial logics – and the related rise of originate-to-distribute-cycles in the mortgage industry have been considered key explanations for the emergence of financial crises. Analyzing a case study in the European real estate industry, we show how actors strategically manage inter-organizational relations and take advantage of rising asset prices, through refinancing on the basis of loan-to-value even before the originate-to-distribute-cycle of the mortgage industry unfolds. Valuation and accounting are core practices of financialized business models that evolve around management fees, which serve as value carriers and bring potential future profits into the present. Auditing also plays a role as it legitimizes these business activities and facilitates jurisdictional arbitrage. We contribute to the accounting literature by explaining how the strategic configuration of a valuation-accounting nexus leads to organizational short-termism and rewards unsustainable business activities in the real estate industry. In July, the University of Bremen will host Prof. Eve Chiapello for two events. Chiapello is a renowned sociologist and currently research director at L’École des Hautes Études en Sciences Sociales (EHESS) in Paris. Her research focuses on the transformation of capitalism through management tools, valuation, and accounting. In 1999, she published Le nouvel Ésprit du Capitalisme (English: The New Spirit of Capitalism) together with Luc Boltanski, a work systematically analyzing managerial literature from the 1960s and 1990s to detect a shift in the ethos of capitalist society. This book has become something like a moden classic in sociology. More recently, Chiapello´s work has turned to the manifold dynamics of financialization. In a joint research project with scholars at the University of Hamburg, Chiapello, for instance, explores the “financialization of valuation and public policies”. In Bremen, she will give a talk on “The Financialization of Public Policies” within the BIGSSS lectures series (5 July). Moreover, she will be guest at a “Politics & Finance Seminar” of our research group on “Devices, Conventions and the Study of Neoliberalism” (6 July). In this seminar, we will discuss her recent article “Critical accounting research and neoliberalism”. As a kick-off for our discussion, Martin Nonhoff (InIIS) will comment the paper. If you want to participate in the seminar, please contact s.moeller[at]uni-bremen.de. Sebastian Möller has written a new blog post for “Manchester Capitalism: A View From The North”. In his contribution “Mapping & Understanding the Networked Character of Finance”, he summarizes the “Networks in Finance Workshop” held last December in Manchester. This workshop was organized by Adam Leaver and Daniel Tischer from the Manchester Business School. On this occasion, scholars from different fields of study have discussed the roles of networks in different areas of finance and the value of network analysis for understanding ongoing processes and dynamics. At this workshop, also Sebastian Botzem presented a paper co-authored by Natalia Besedovsky on the reconfiguration of the global financial elite. The blog post provides a brief overview of the different projects presented in Manchester and sketches out some routes for further research. The “Politics & Finance” research group is hosting a reading session on process tracing in IPE (and byond) on 01 June (10-12) at InIIS. We will read and discuss selected contributions from a recent special issue of New Political Economy. The program for the event can be found here. If you wish to participate, please send an email to smoeller[at]uni-bremen.de. In September, the Warwick Critical Finance Group will be hosting the sequel of last year´s Young Scholars Workshop on interdisciplinary finance studies. The workshop is titled “Taking the next step: new frontiers in the interdisciplinary study of finance” and will take place on 25 & 26 September 2017 at the University of Warwick (UK). The Call for Papers can be found here. Paper proposals are due on 1 June. The event will provide an excellent opportunity to continue our discussions on the ongoing and manifold daynamic changes of finance, it´s transformative influence on various realms of society, and further avenues for the intersdisciplinary agenda of finance research. Moreover, the workshop is targeted at further strengthening networks and collaborations of early career researchers. On 8 April, Sebastian Möller will be presenting his research on municipal derivative deals across Europe at this year’s Annual Meeting of the American Association of Geographers (AAG) in Boston. His presentation is titled “The financialization of municipal debt management: How did interest rate derivatives enter city hall” and will open a row of three panels on “Financialization as a State Project”, organized by Caroline Sage Ponder and Mikael Omstedt (both from the University of British Columbia). Manuel Aalbers (KU Leuven) will discuss the papers presented in the first two sessions. In Boston, there will be a range of panels and other events on the emerging field of financial geography, partly featured by the newly founded “Global Network on Financial Geography” (FinGeo). Sebastian receives a travel grant from the German Academic Exchange Service DAAD that allows him to take part in this excellent conference. In November 2017, the City University London will be hosting the second “Intersections of Finance and Society” conference organized by the “Finance and Society” Journal, the Finance and Socitey Network at the University of Sydney, and the City Political Economy Research Centre (CITYPERC). The Call for papers for this conference has been announced now. Last year´s inaugural conference was a mayor success and brought together hundreds of finance scholars from different disciplines and from all over the world. Abstracts for this year can be submitted until 01 August. Melinda Cooper and Joseph Vogel already have been confirmed as keynote speekers for this event. 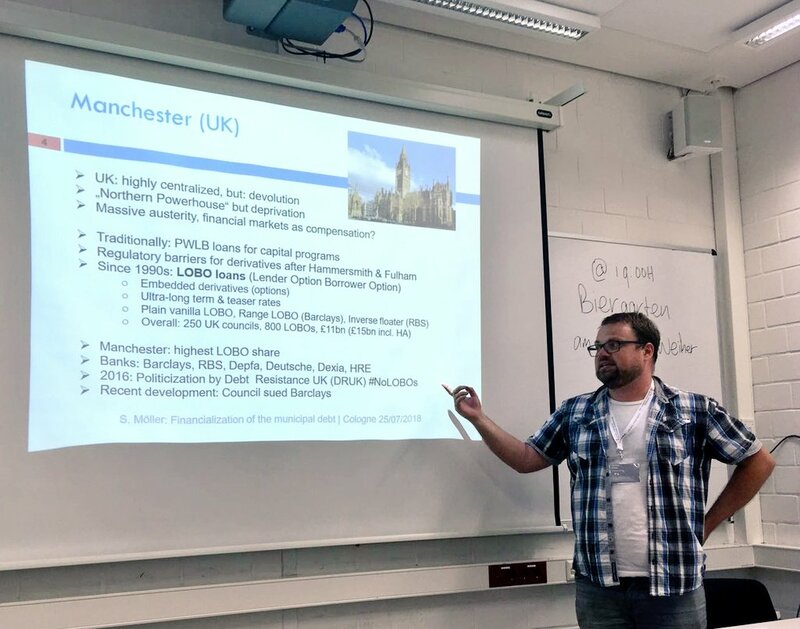 In December, Sebastian Botzem presented preliminary findings of the Global Financial Elites project at the “Networks in Finance” Workshop at the University of Manchester, organized by Adam Leaver and Daniel Tischer. The paper, co-authored by Natalia Besedovsky, investigates the dynamic development of the global financial elite network drawing on the GloFIELD database which includes the big players of finance and their connections to other organisations via personal links. Comparing the network structure over 25 years, Sebastian and Natalia find that organizational relations become more dense over time and that the global network changes notably after the financial crisis. In particular, regulators, international organisations, and the industry itself lose connectivity while private non-profit organisations like think tanks and professional associations move towards the core. In the 2013 network, for instance, the World Economic Forum (WEF) is the most centrally located organization . Interpreting networks as infrastructure of soft power relations and knowledge flows, these changes might indicate an increasing demand of sense-making, persuasion, and a need for reassurance after the crisis. Network structures also signal a renewal of the dominant self-regulatory pattern in financial governance. The rise of new actors in the financial elite network certainly merits further research. The workshop brought together both renowned and emerging scholars from different disciplines interested in network structures and dynamics within global finance. Participants discussed the usefulness of network analysis in understanding financialization and structural changes in different financial sectors. A consensus emerged that social network analysis helps us a great deal in this respect since it enables the mapping of actor constellations over time and the connectedness of finance across sectors and borders. The workshop, however, also showed that network analysis does not replace the theorization of social relations and dynamic change in finance and ideally needs to triangulated with other methods. In January, the research group “Transnational Political Ordering in Global Finance” continues its “Politics & Finance Seminar Series” ith a discussion on investment clubs as homosocial groups. Lydia Welbers, doctoral researcher at the Research Center on Inequality and Social Policy (SOCIUM) at the University of Bremen, presents tentative findings and thought on her ongoing doctoral thesis in a project on decision-making practices of small investors. Abstract of Lydia´s talk: Investment clubs (as associations of small investors, which pool their money) have to decide together, how to invest their money on the financial market. On the group level, members of the group look quite similar. Therefore these groups can be divided in male and female associations. The talk focusses on the added value by describing investment clubs as homosocial groups by mentioning differences and similarities between these groups and their decision making processes. After the presentation, there will be plenty of time to ask questions and discuss various aspects of the topic. If you wish to attend the seminar, please write an email to smoeller[at]uni-bremen.de.